We are stuck on this text at the European Parliament, which position comes to keep in the hands of civilians dangerous automatic and semi-automatic firearms. 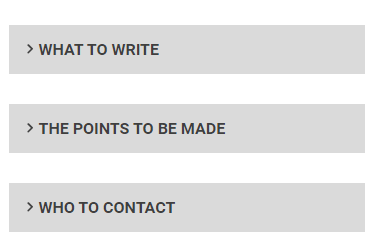 We need your help in order to convince your colleagues at the EP [to get them banned]. On November 24th, the Firearms United network received classified and very reliable intelligence according to which the European Commission would be exerting an unprecedented amount of pressure on the European Parliament to reach an end to the trilogue before the end of the year; and such an agreement would be on the Council’s position. Given how many of the biggest member States agree on many points – with the governments of Germany, France and Italy being among the main sponsors of what is now in-famously known as the “EU gun ban” – the European Parliament may indeed be forced to capitulate. Why this reaction, and why now? 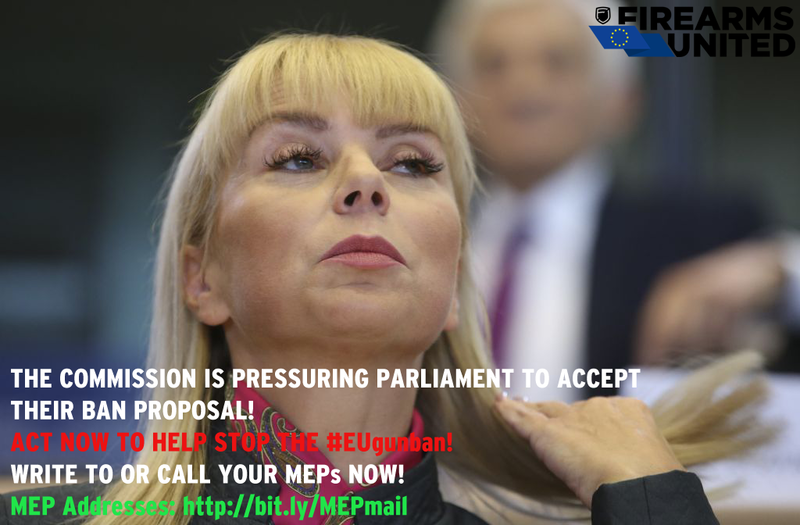 The outcome of the November 16 conference at the European Parliament in Brussels terrified the Commission. It is now clear that the gun owners and gun enthusiasts’ community Europe-wide could all come together, and that the Firearms United network could turn into a real European NRA. The European Commission realized that the Firearms United network could be able to show their lack of arguments and dismantle the EU gun ban plans piece by piece. Last, but not least, the external players who influence or guide the European Commission’s gun ban attempts are also restless. Those include the governments of at least three founding EU Countries (France, Germany, Italy), plus many others – the United Kingdom probably being among them despite Brexit. Among those players also are several prominent anti-gun NGOs that have so far been very supportive of the EU gun ban, from the Flemish Peace Institute to the Small Arms Survey. Those NGOs are far from being grassroot organizations, and are often funded by millions of Euros (or dollars) from other non-governmental lobbyists and anti-gun millionaires. Gun owners Europe-wide must once again contact the Members of the European Parliament to make their point. The Firearms United network is thus urging all gun owners, gun enthusiasts, and freedom lovers in Europe – as well as industry and business stakeholders in the field, from manufacturers to distributors and retailers – to support the MEPs who oppose the EU gun ban with a new massive E-Mailing campaign. Although most Members of the European Parliament have all issues perfectly clear in their minds after the November 16 conference, those E-Mails will provide them with some solid support from the European people to base their resilient opposition. That’s why all E-Mails must be measured and accommodating in their tones, but nonetheless as clear as it gets in explaining what we want. And they must be written with a personal touch: no massive cut-and paste and no massive sending of thousands of carbon-copy E-Mails, since they would be blocked by Spam filters or, worse, would make the European gun owners community like a mass of brainless individuals who can’t write a letter on their own to explain their reasons with their own words. 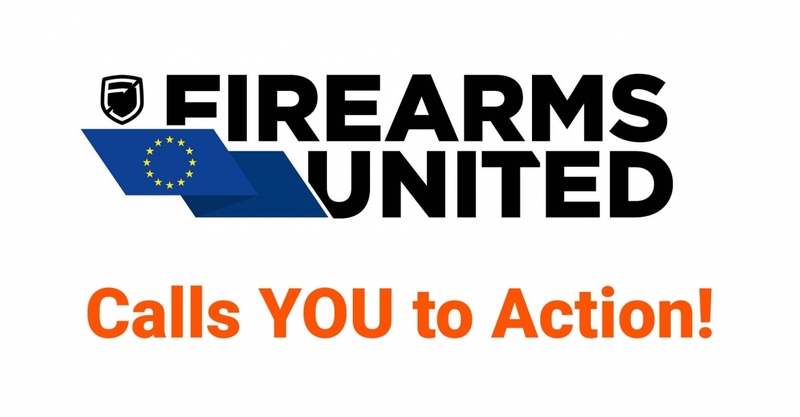 Firearms United is providing some suggestions for the points to make in your E-Mails – which should be written and sent to the Members of the European Parliament no later than next Monday, or Tuesday morning at the most. Once again – and just like they did for the November 16th conference – industry and economic stakeholders are keeping dead silent in the hour of need. As used as we may be to see them play deaf (and blind), it has to be said that the feedback gathered by the Firearms United network among its followers towards this behaviour is not good at all: a vast majority of European gun owners seems to be inclined to consider the European gun industry a covert supporter of the EU gun ban plans. And this can’t be good for business. Manufacturers, importers and exporters, distributors and retailers would be better off holding their national governments accountable for their position at the Council. They would have full reason to, given how reportedly, among the typical confusion of the European institutions, some of the representatives of the Member States who are lobbying for further restrictions on legally-owned firearms seem to be vastly exceeding the mandate they received from their governments and Parliaments. Counting on the fact that nobody will ever hold them accountable, some anti-gun government bureaucrats are supporting the Commission’s EU gun ban plans regardless of what they have been told to do by the governments they’re supposed to represent. In other cases, they are indeed following closely a secret mandate from their governments. The Firearms United network has solid intel to accuse some governments of double-crossing the stakeholders: while they officially do not support the restrictions as they would harm the national industry or defense, in Brussels they secretly support the EU Gun Ban plans hoping that they’ll be allowed to impose more restrictions to law-abiding gun owners with the old “It’s the EU, not us” excuse, because they could not otherwise take direct political responsibility for impopular and counterproductive bans that the national democracy would certainly stop. How can the European gun industry just keep silent in front of all this? We don’t know! This is the final rush: the outcome of the fight depends from you and what you’re willing to do! Given the number of variables, it’s very hard to say now. What’s for sure is that the European Commission and all European gun ban supporters are desperate: they are afraid that they would loose the battle and that they would not have a chance to try again in the future due to the birth of a powerful “gun lobby” in Europe. And indeed, the defeat of the anti-gunners and the birth of a powerful gun rights advocacy group in Europe is what we all should aim for; but this takes effort, an effort to which we all are now called to contribute by wasting some hours of our weekend to write and send E-Mails to the Members of the European Parliament. What the anti-gun front has so far failed to realize, however, is that the Firearms United network would have never arrived to the current levels of influence if the European Commission hadn’t decided to attack law-abiding gun owners back in November 2015. Now avaliable in ALL languages of the EU!